University of Houston alumna and two-time Olympian Dr. Seun Adigun recently shared her Olympic experiences with graduate students and invited undergraduates in Dr. Pearson’s Sport and Contemporary Society graduate course. Over the years the course has hosted numerous UH Olympians and star athletes; however, this invited guest was a bit different. Dr. Seun Adigun, a M.Ed. 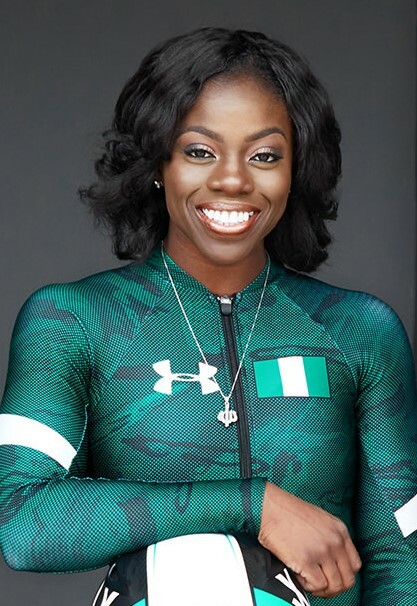 2011 HHP graduate and former track standout at UH, not only participated in the 2012 Summer Olympic Games representing her native country Nigeria, but most recently represented Nigeria’s first bobsledding team in the 2018 Winter Olympics at Pyeong Chang, South Korea. This was quite unusual since Nigeria does not get snow, nor has it ever owned a bobsled. As a matter of fact, the practice sled used to train the upstart female team was made by; you guessed it, Adigun; as well as the sponsorship solicitation, and recruitment of team members. Needless to say, her passion for sport and desire to demonstrate that few obstacles are unconquerable if you believe in yourself sends a very powerful message. Dr. Adigun, who recently completed chiropractic school challenged the students when she stated, “I once sat where you are today.” She noted that the support from her religion, parents, friends, and unknown strangers helped make her dreams a reality. Can you imagine sitting in a sled cascading down the side of a snow-covered mountain in excess of 90 miles per hour with no brakes? Now wake up! You were dreaming or recalling memories of the comedy Cool Runnings featuring the fictional Jamaican bobsledding team. For Dr. Adigun and her teammates it was reality.